Beautiful, clean, bright 2 bedroom house right on desirable Panther Pond! 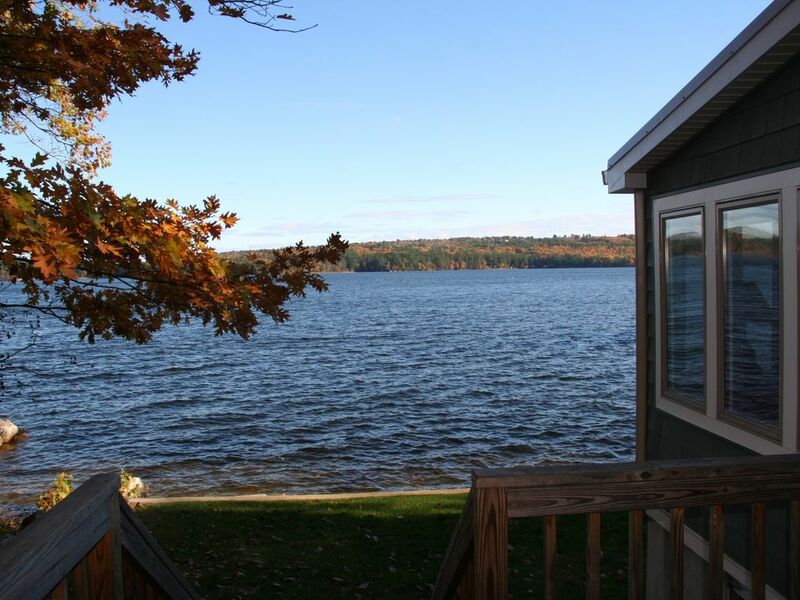 Cottage has 65 feet of unobstructed waterfront with breathtaking views and easy, comfortable access to the lake. 2 large rock stairs down to sandy bottom and amazing aluminum dock with stairs down to water and a bench for relaxing. Great for fishing! Cottage has been fully refreshed for the 2017 season and offers a wide open floor plan with a full wall of windows looking over the lake . . . feels like you're on a boat while you're in the house! Updated kitchen with stainless appliances and fully stocked with everything you need for cooking. Large dining table with seating for 8. Several sitting areas including a TV area with a new 55" flatscreen Smart TV and a cozy area with beautiful built-in book cases and a working gas fireplace. Bedrooms have new mattresses , pillows, and down-alternative comforters with duvet covers; no need to suffer uncomfortable mattresses while you're on vacation! Bedroom 1 has a king bed, bedroom 2 has new twin over full bunk beds with a trundle. Bathroom is clean and bright with full washer and dryer. Large deck of the living area with gorgeous views of the lake; stairs lead down to a lovely grass lawn and the lake. Property has been appointed for families and is stocked with toys and children's books. Ice cream, sandwich shop and a market are minutes away, property is 10 minutes from Windham and 25 miles from Portland. We have rented lake houses for years and understand what can help make your vacation truly amazing; all details have been taken into account in preparing this house for you! Kitchen is open to living areas with stainless steel appliances, beautiful wood cabinets and is fully stocked with cooking necessities. Beautiful house with an amazing view! Fully stocked, clean and warm during the cold december nights! We loved everything about it including the location. Michael was super helpful with any area recommendations and quick to respond to any questions! First off the view from the house is breathtaking. Wonderful location near town. The owners are super helpful with any concerns. I would definitely recommend this property. What a fantastic way to end the summer! We walked in to a fully stocked pristine home. Everything was neat, clean and welcoming. Each room was very comfortable including the beds. The sunrise each morning was amazing out the back windows which covered the entire back wall. The lake was literally steps from the cottage. We had a fabulous week and are already thinking about next year! This was by far one of the nicest rentals we have found. Michael was easy to communicate with and very responsive. It was a pleasure all around. My husband and I stayed here for a week with our three kids and had a wonderful experience! Mike was super easy to deal with and very prompt and thorough with his responses. The lakehouse was well-stocked and clean, which is a high priority for us. We had everything we needed, plus some, and all the beds were comfortable. The views are absolutely beautiful (especially early morning) and the lake was so relaxing with an entry that was perfect for my kids. We all enjoyed swimming, kayaking and floating on the lake. We had one rainy day with torrential downpours, and if the house had not been so clean and comfortable, I don't think we would have enjoyed having to be inside for the duration. There is also a major shopping area with restaurants just 15 minutes away, with convenience stores even closer. I would highly recommend Mike's lakehouse and would definitely like to stay here again! We really enjoyed our stay at this property. Very family friendly, great layout for children and adults. It is located close to the lake and the living room has wonderful windows that give you the feel that you are right on the water. Owners were very helpful with information and tips on the area. We had a wonderful stay. Everything we had hoped for and as advertised. Quiet, comfortable and clean with a great view. I enjoyed the easy access to the water and there isn't anything better than floating on a raft or reading a good book with strong coffee to relax. Mike was great to deal with, always very responsive and helpful. Thank you for a wonderful stay.